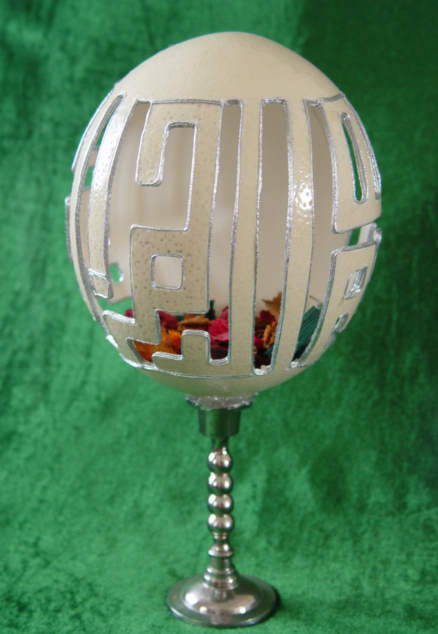 Ostrich Egg is carved to form intricate symmetrical patterns on both sides and lined with silver cord. The top is decorated with painted sea-shells. 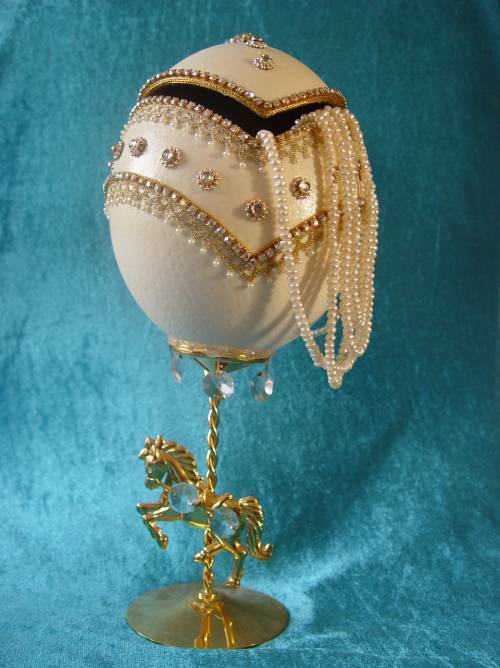 The inside of the egg is decorated with organza and velvet. 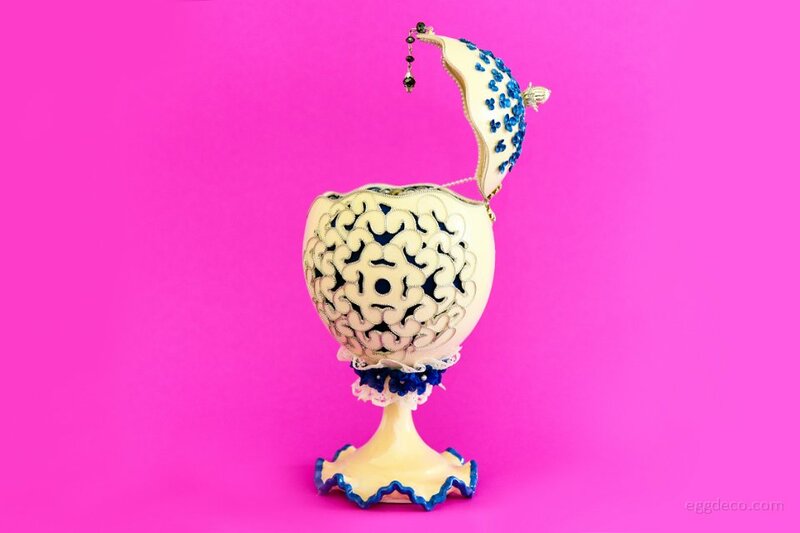 A tassel is attached to facilitate easy opening of the egg, which is mounted on a painted ceramic stand. 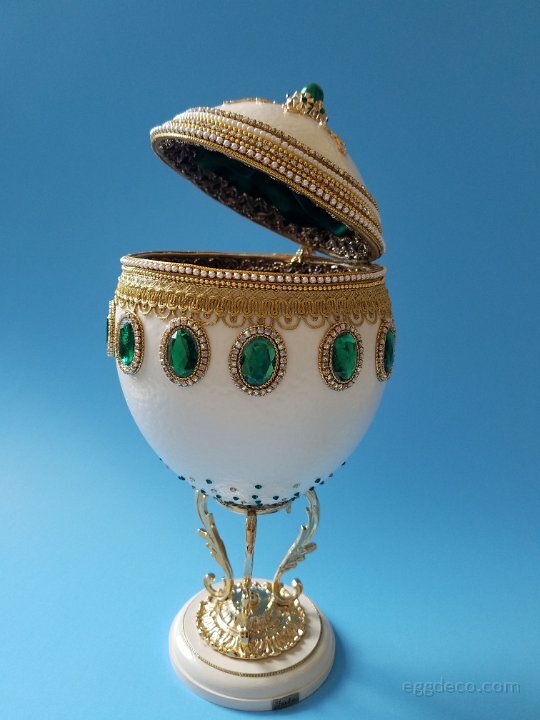 Ostrich Egg jewelry cascade is cut all around in the form of peacock feathers, lined with golden cord. A silk transfer showing a pair of peacocks is affixed on the top. 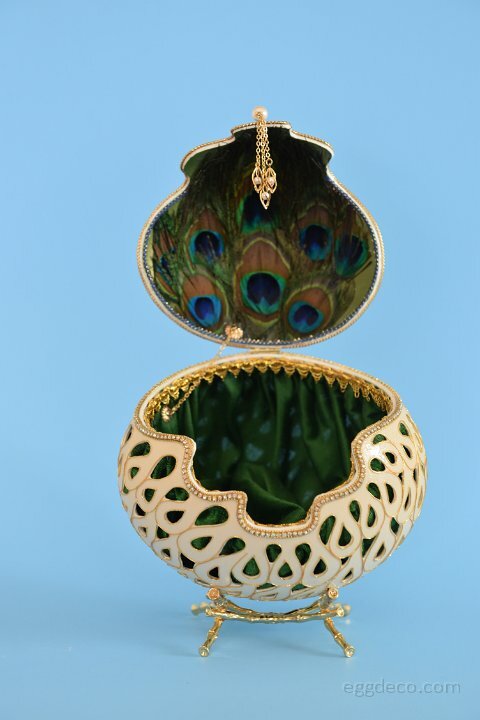 The bottom portion inside is lined with heavy green velvet, while the lid is decorated with peacock feathers. Ostrich Egg cut and modified to form a ‘Tree House’. 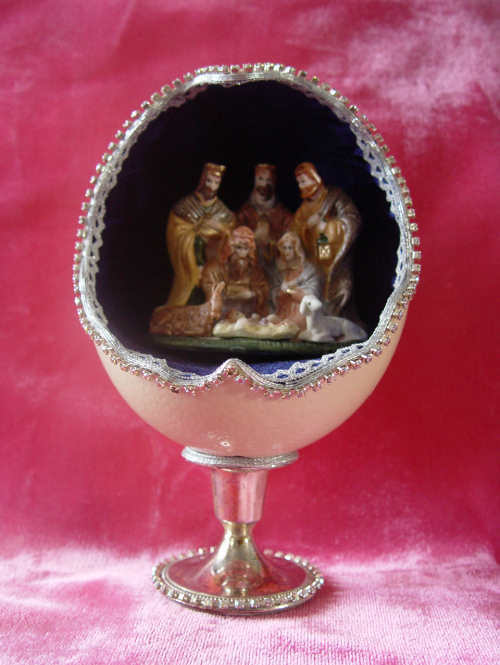 A door and two windows are cut in the egg shell. The middle portions of the doors and windows are cut and replaced with two acrylic pieces sandwiched by golden mesh to facilitate viewing the interior decoration. 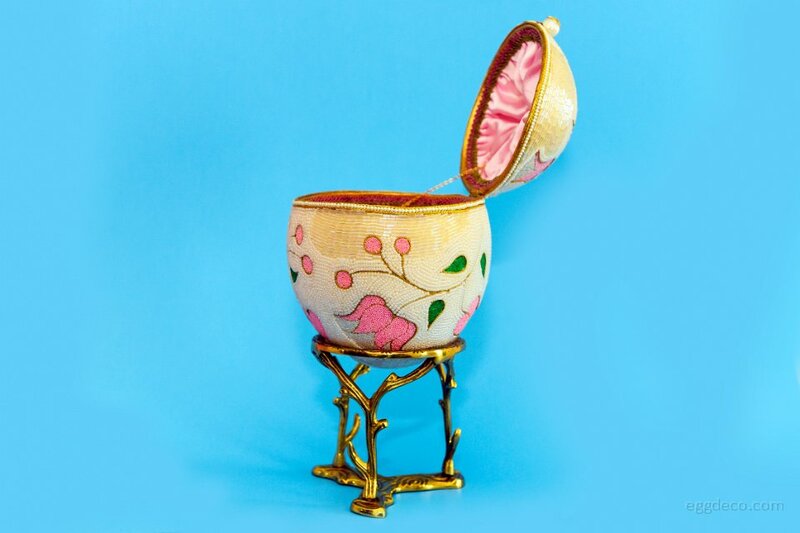 A table and seater are made out of an Araucana Egg shell, which are painted and decorated with water-sliding transfers and kept inside the Ostrich Egg shell. 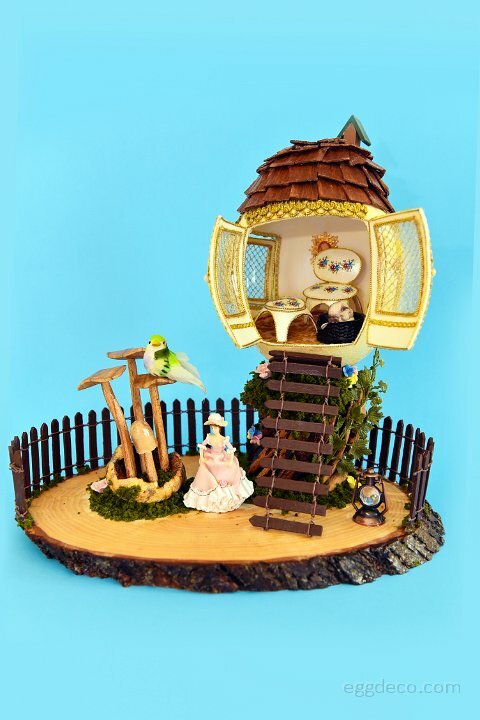 The roof of the ‘Tree House’ is made of painted wooden pieces and arranged on the top of the shell. 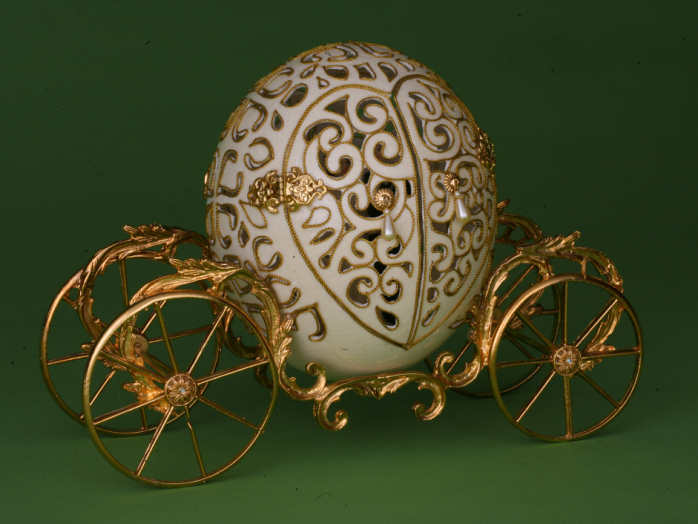 Ostrich Egg is cut to form two compartments with three door openings. The top of the shell is decorated with a satin print and water-sliding transfer. The two side doors are carved in a mesh pattern and lined with a pearl string. Tassels are placed on each of the doors to facilitate opening. 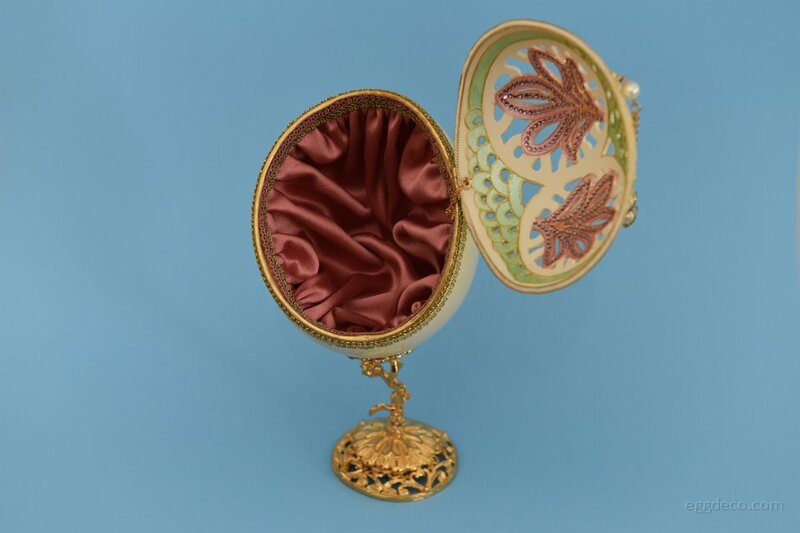 The compartments are lined inside with brocade. 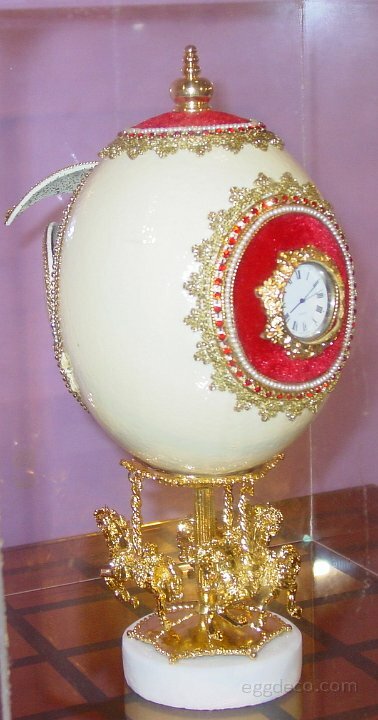 The egg is mounted on a golden stand. 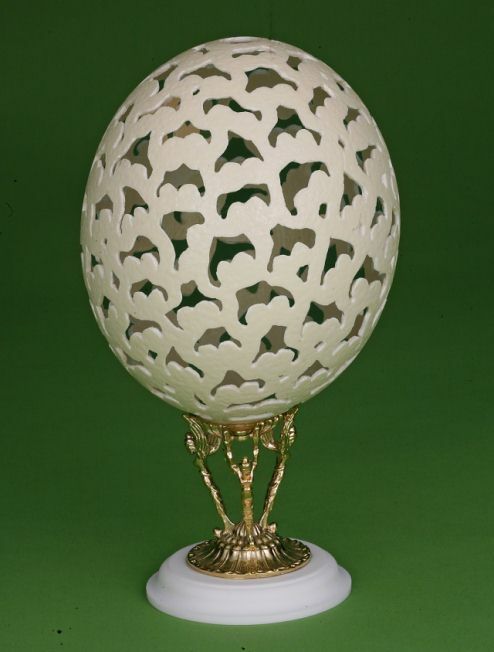 Ostrich Egg is cut with an opening on the top to form a ‘Treasure Chest’. 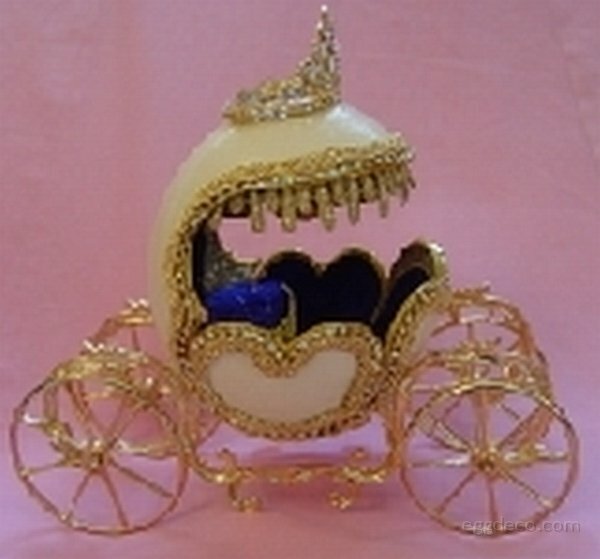 The egg is heavily decorated with golden cord, pearl chains and rhinestone chains along the edges of the shell. 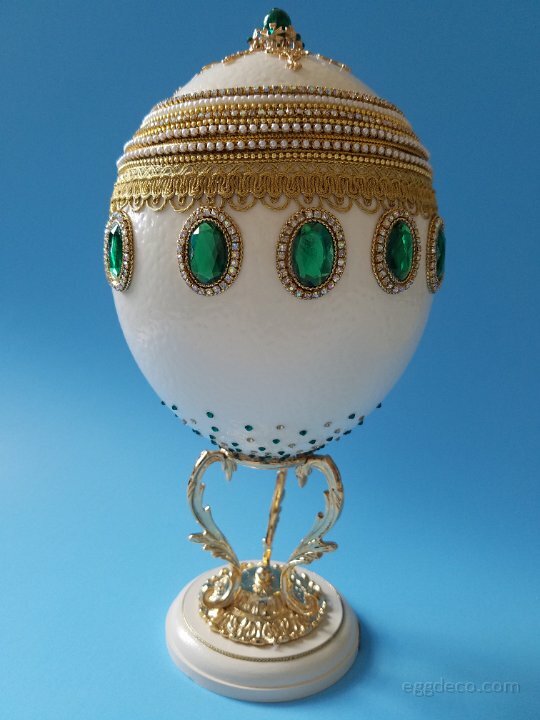 The upper half of the egg shell is embellished with radiating golden filigree, while the bottom half with green crystals surrounded by golden cord, rhinestone chains and small loose flat-back crystals. 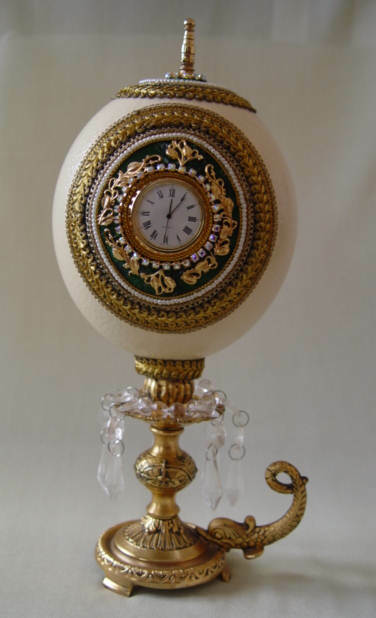 This is a classic design incorporating the natural shell of the Ostrich Egg. 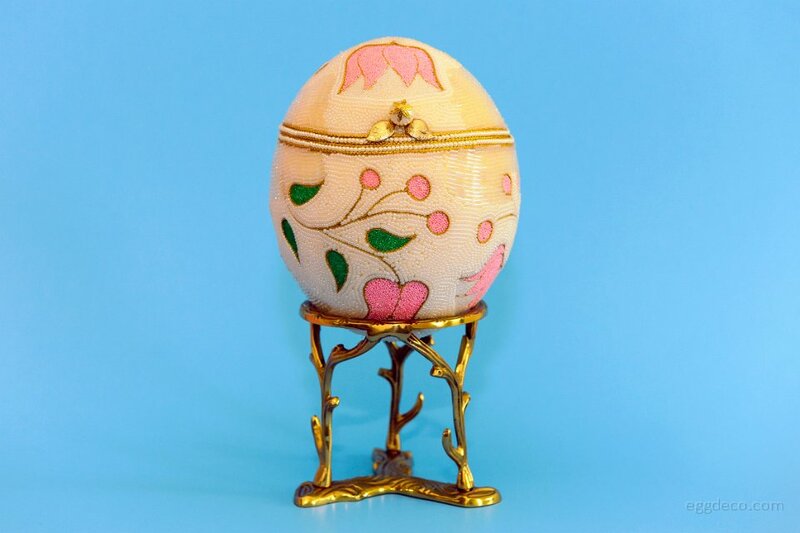 The egg is divided into four vertical faces on which silk transfers depicting Indian beauties are glued in the center on all the four sides. The transfers are outlined with pearl strings and golden laces. 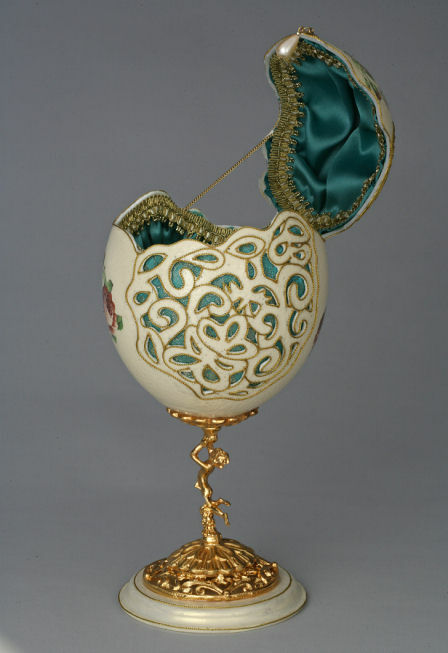 The egg is lined inside with heavy brocade. Ostrich Egg is cut to form a slanted opening. 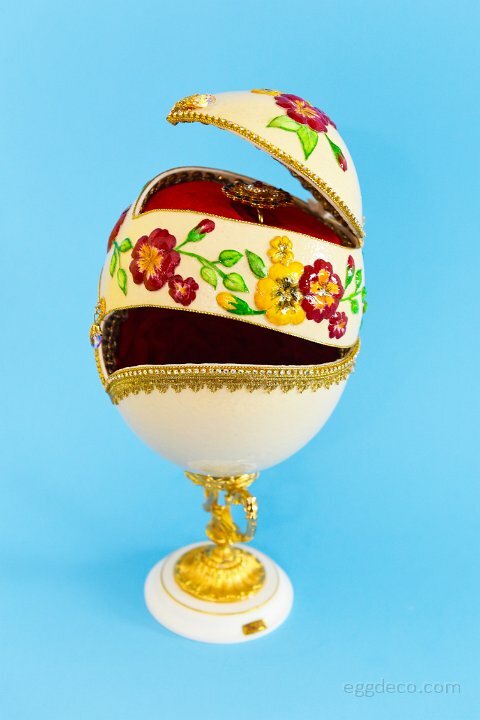 The face of the egg is cut in unique floral patterns, which are painted on both sides. Embellishment is done using flat-back crystals and golden cord. 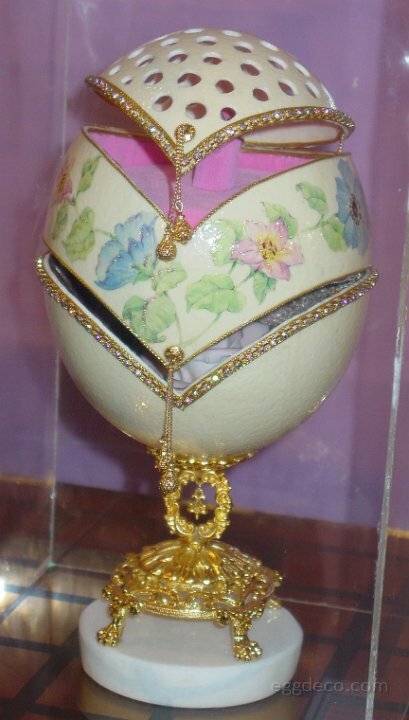 The interior of the egg is lined with satin. 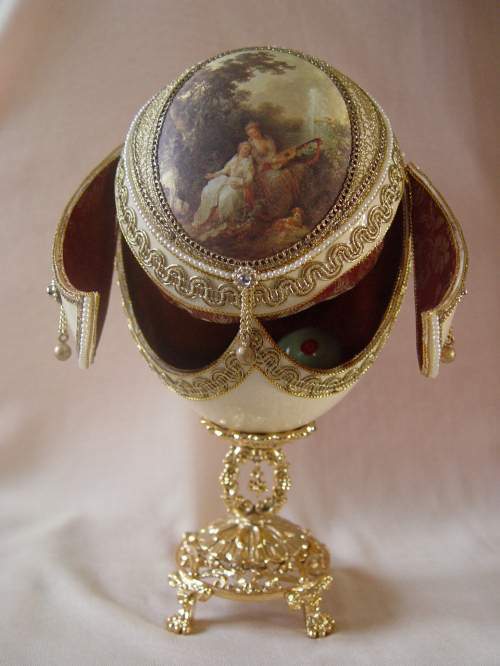 A fancy tassel is attached to facilitate the opening of the egg, which could serve as an excellent jewelry case. 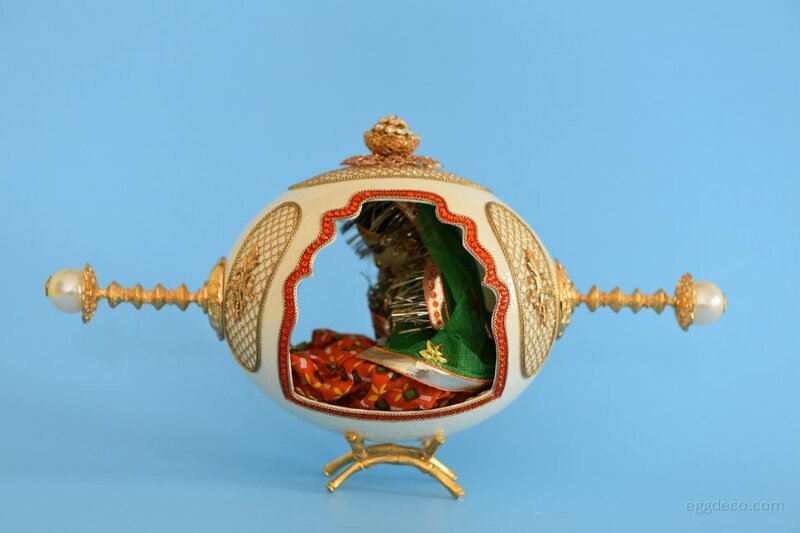 Ostrich Egg is carved into two compartments. 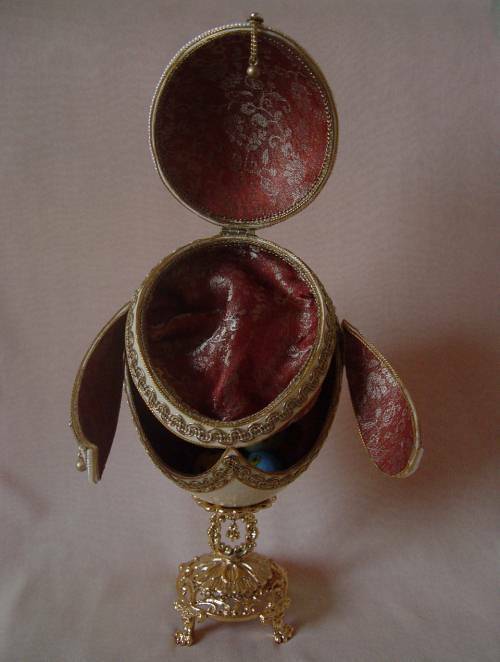 The upper chamber serves as a ring holder, while the lower chamber, lined by red velvet, can be used to keep jewelry. 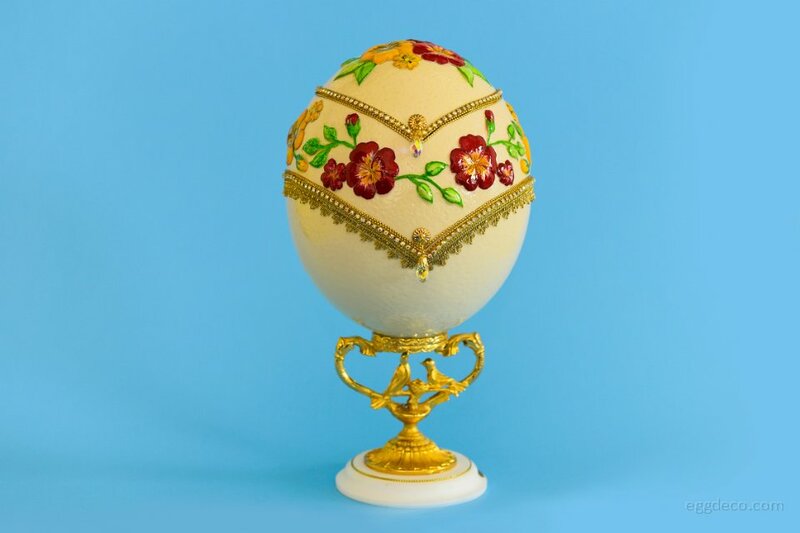 The egg is decorated all around with hand-drawn and painted bas-relief flowers. 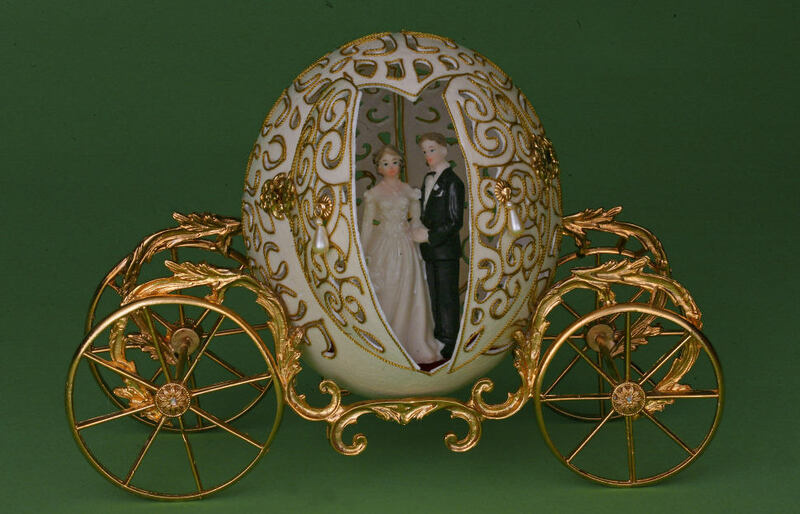 Ostrich Egg is completely carved. 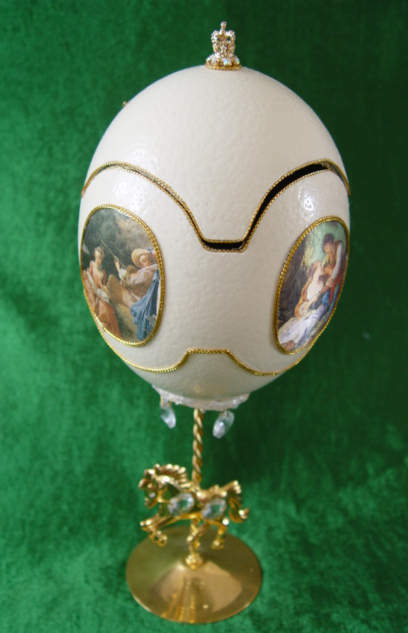 Two additional carved wings are hinged from back of the egg. 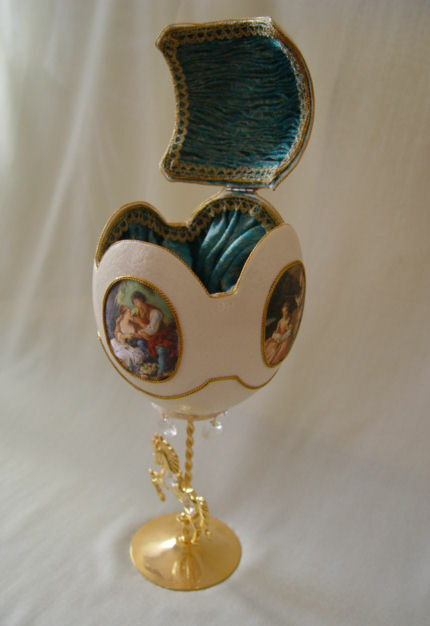 The front opening serves as a seat for a fairy, completing this egg art piece. 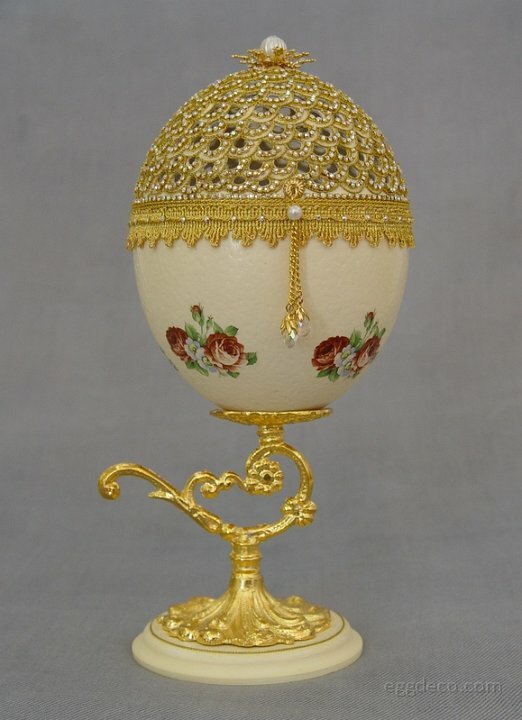 Ostrich Egg shell is cut in the shape of a pearl. 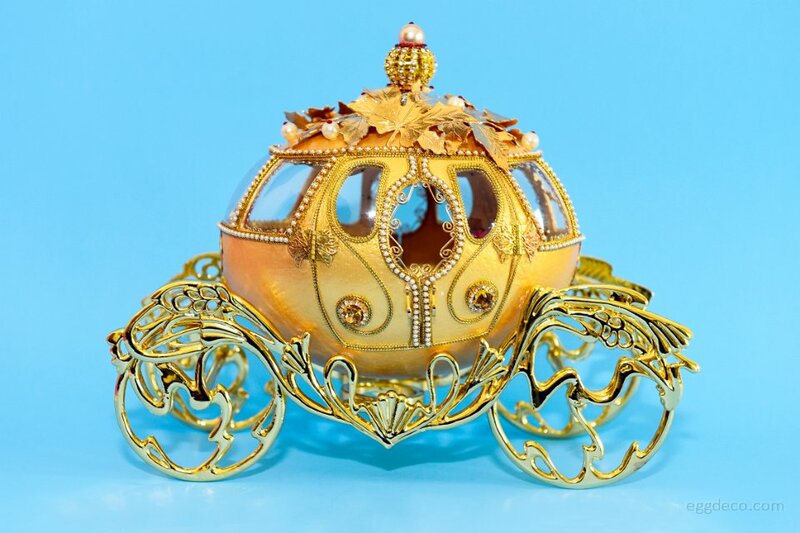 The lid is intricately carved into floral patterns. 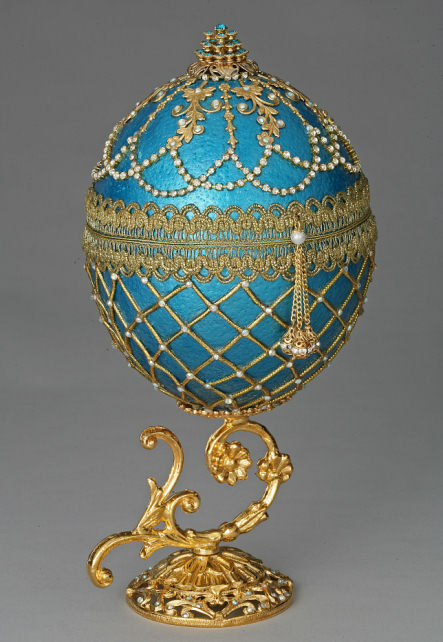 The egg is painted using teal acrylic color leaving the carved portions with pearl finish. 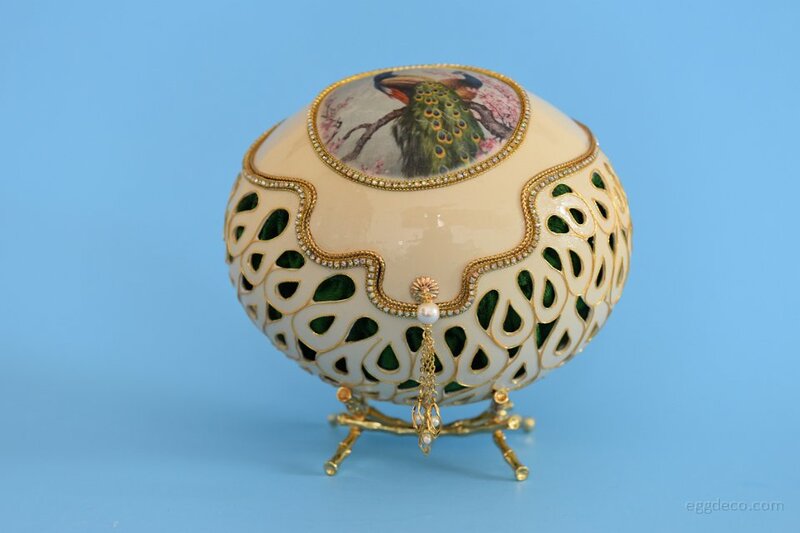 The colored portions on the lid are studded with individual pearls. A beautiful mermaid sits amidst bubbles and pearls. 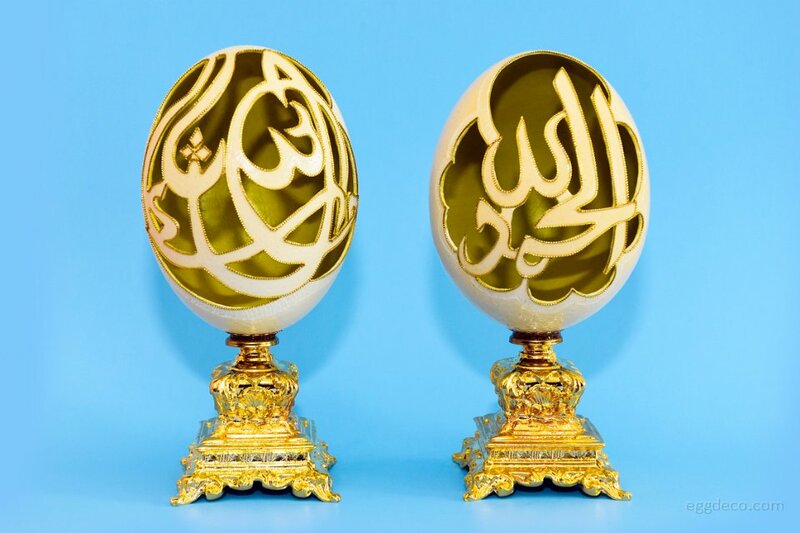 Islamic calligraphy is carved on the front face of the Ostrich Egg and lined with golden cord. 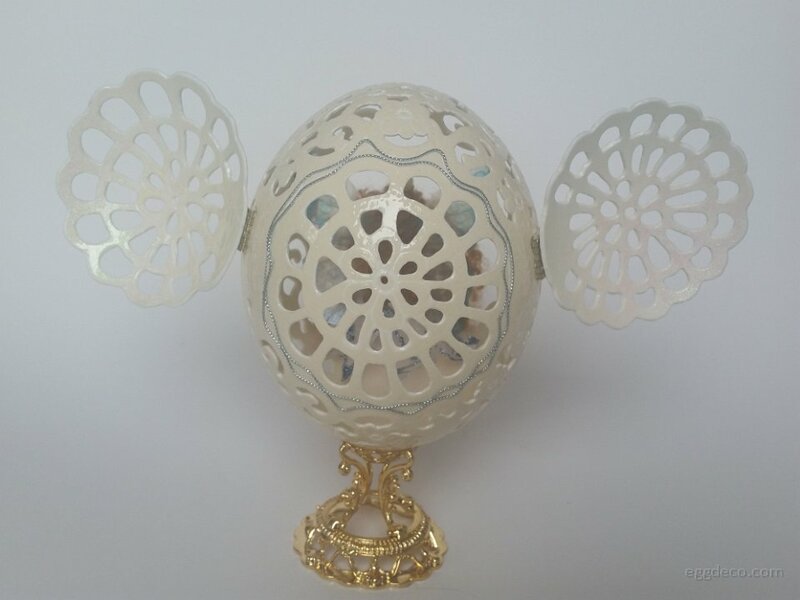 The egg is further enhanced by etching floral and geometric patterns on the top and sides. 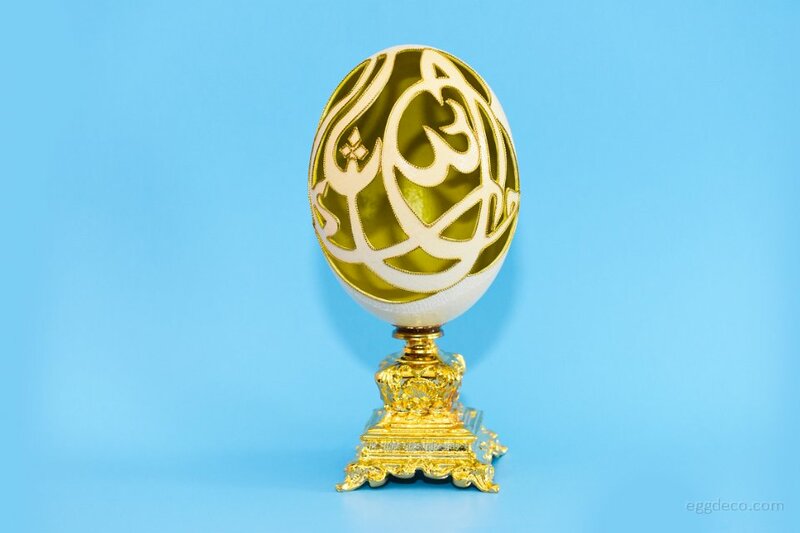 The egg is placed on a golden stand. 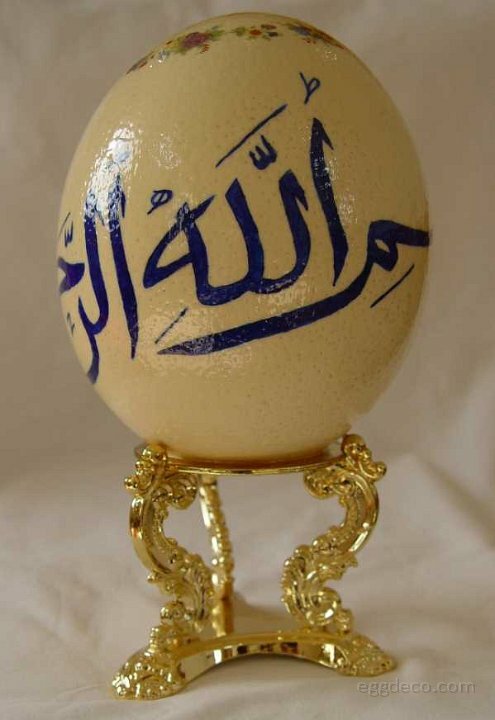 This Ostrich egg symbolizes purity and divinity. 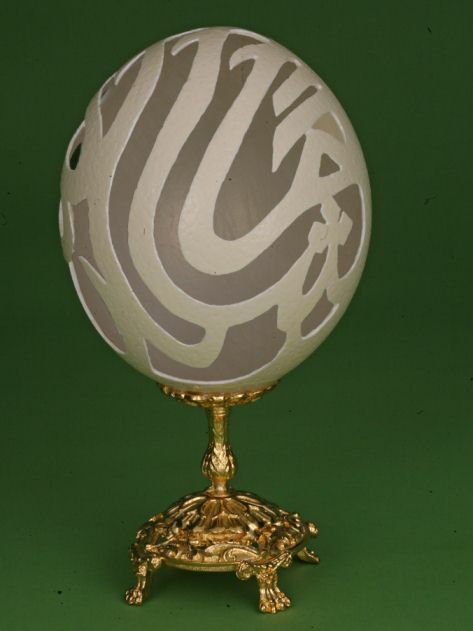 Islamic calligraphy is carved on the front face of the Ostrich Egg and lined with golden cord. 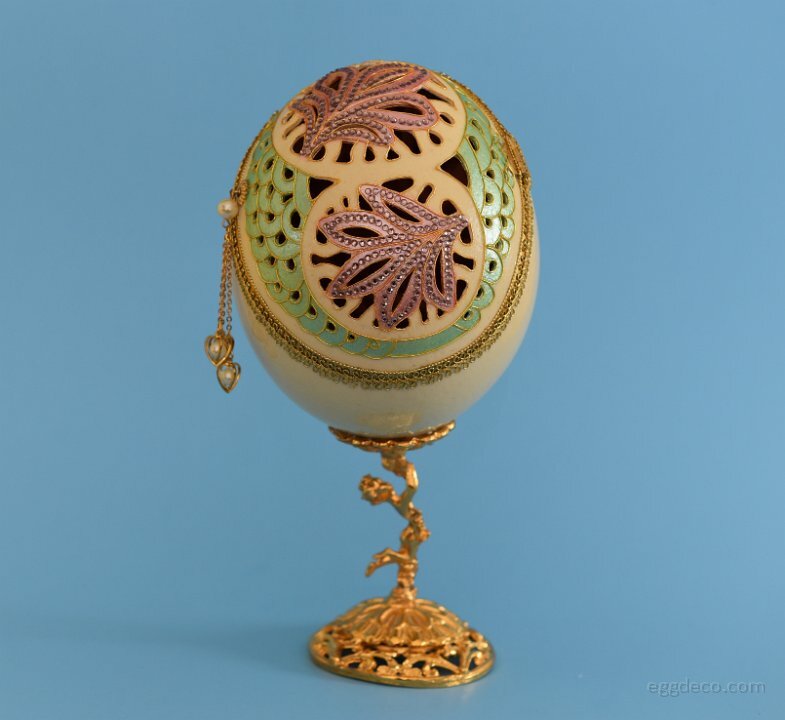 The egg is further enhanced by etching floral and geometric patterns on the top and sides. 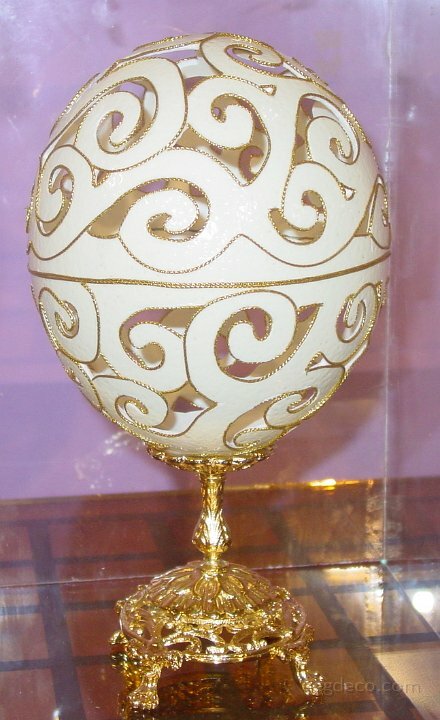 The egg is placed on a golden stand. 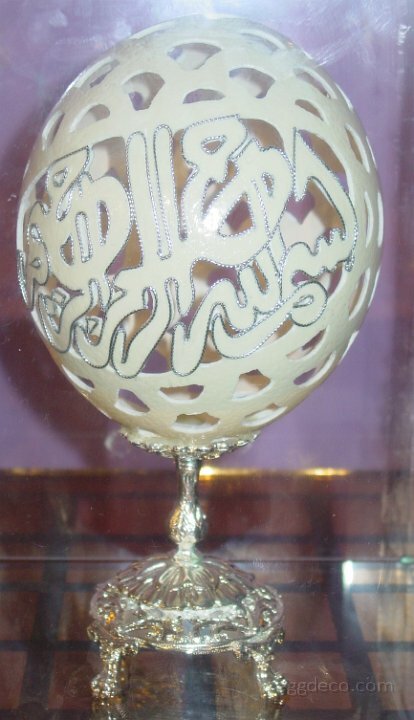 The calligraphy denotes ‘Messenger of God’. 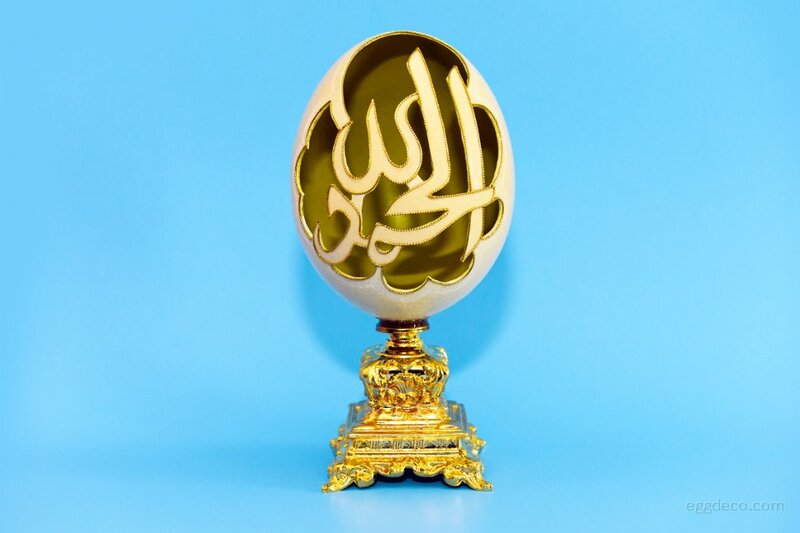 Ostrich egg is carved all around with Islamic calligraphy, which symbolises that all the praises and thanks are to God. The edges of the calligraphy are lined with golden cord. 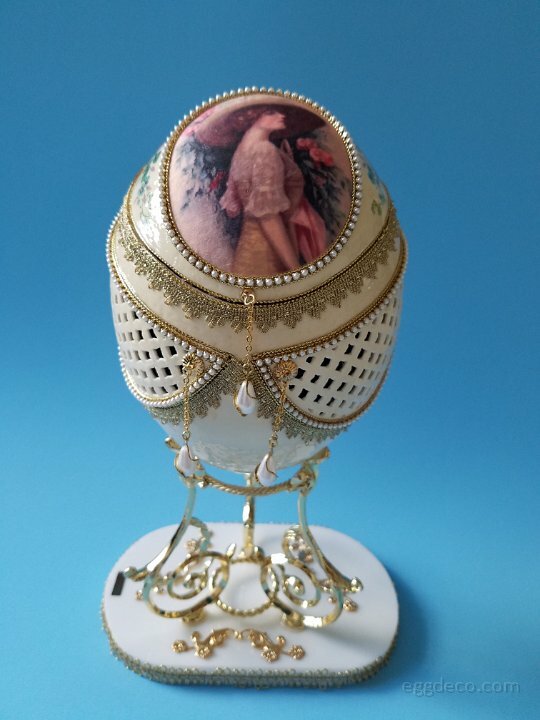 The inside of the egg is coated with acrylic paint. 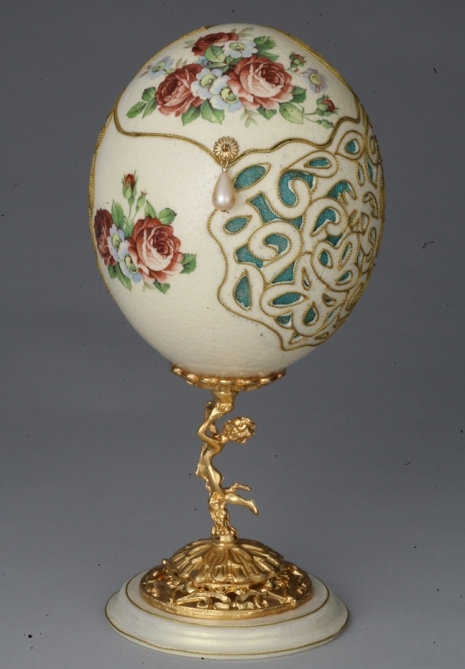 The rear portion of the egg shell is fully engraved with floral patterns. 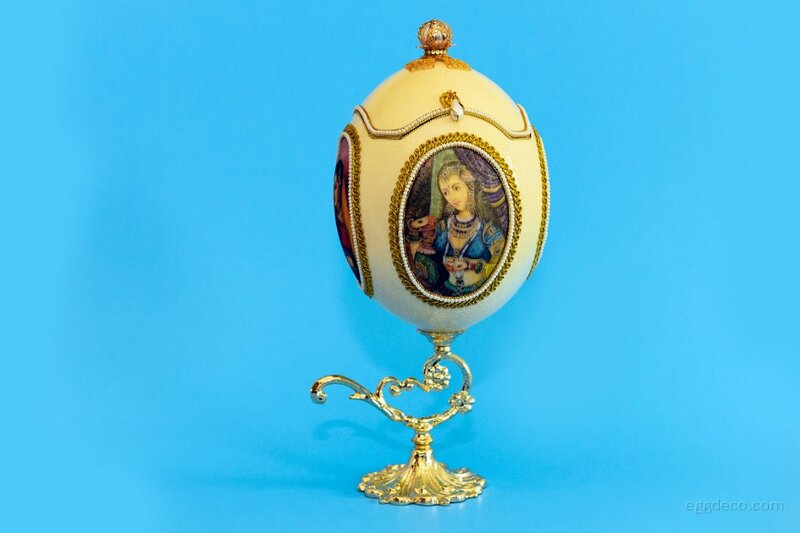 The egg is placed on a heavy golden stand. 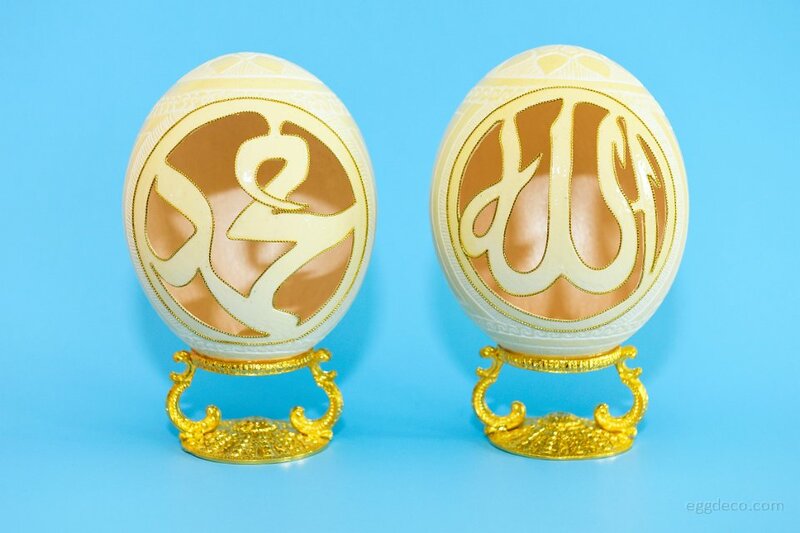 Ostrich egg is carved all around with Islamic calligraphy, which symbolizes that all good things come from God and are blessings from Him. The edges of the calligraphy are lined with golden cord. 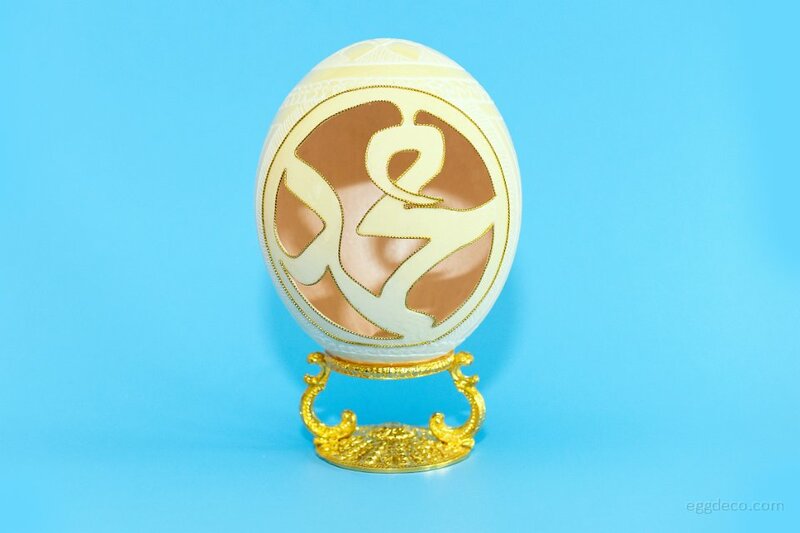 The inside of the egg is coated with acrylic paint. 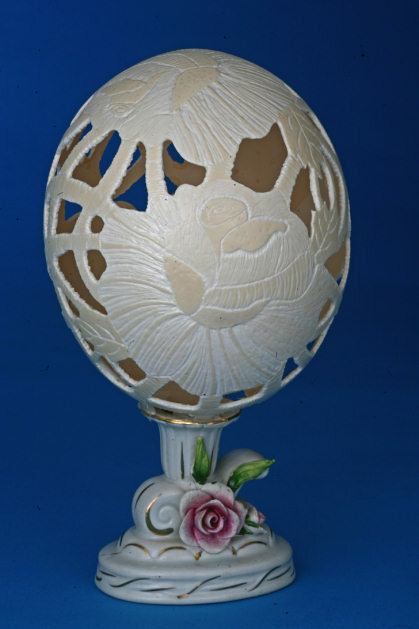 The rear portion of the egg shell is fully engraved with floral patterns. 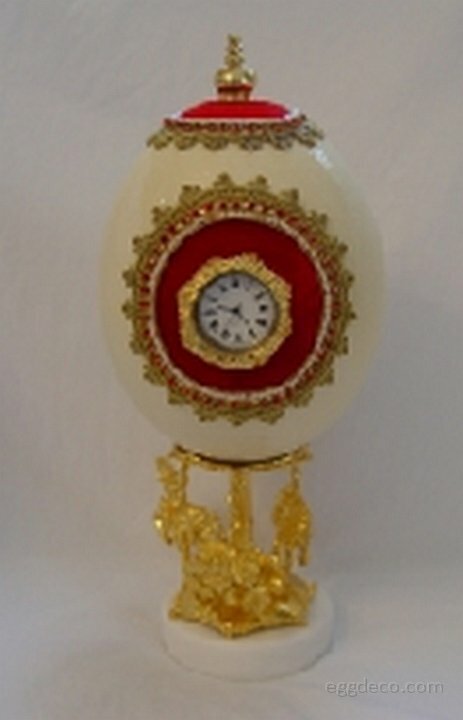 The egg is placed on a heavy golden stand. 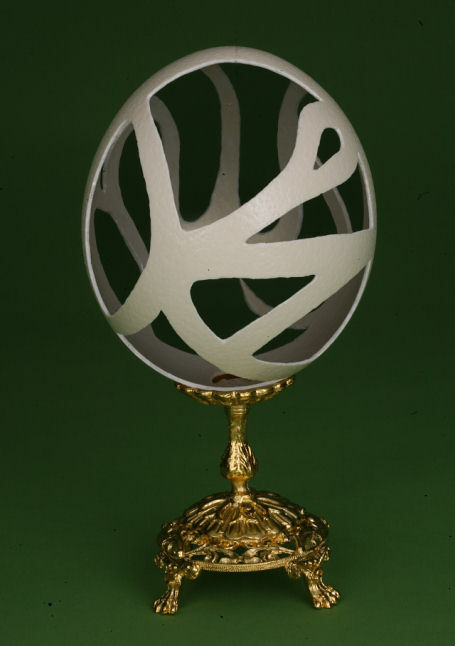 Ostrich Egg in which two openings are cut to form a palki. 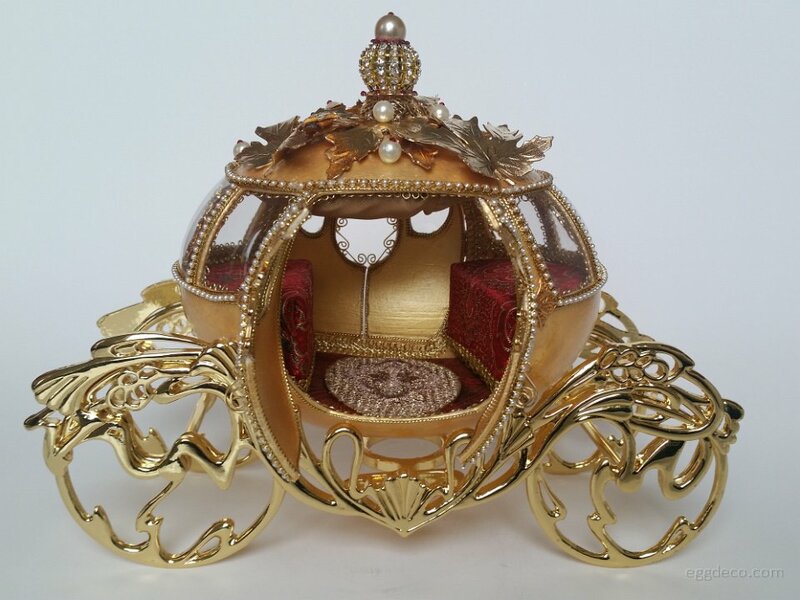 The edges of the openings are painted with red acrylic paint, lined with golden cord and decorated with flat-back crystals. 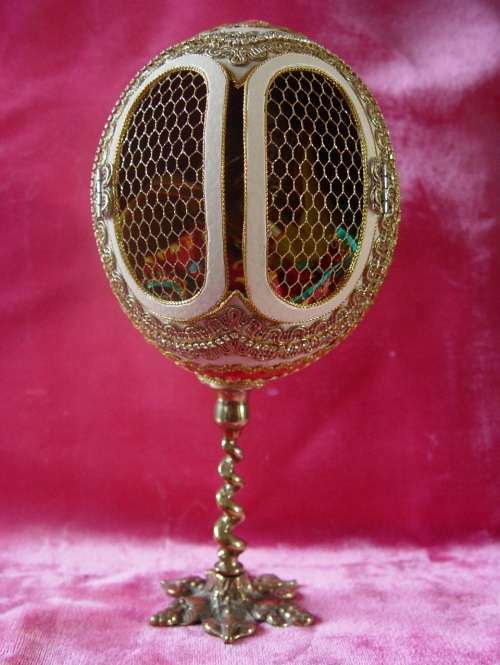 The palki is decorated with golden mesh and filigree on the four sides of the handles. The top is embellished with mesh and a crown. A Rajasthani bride is seated inside the palanquin. 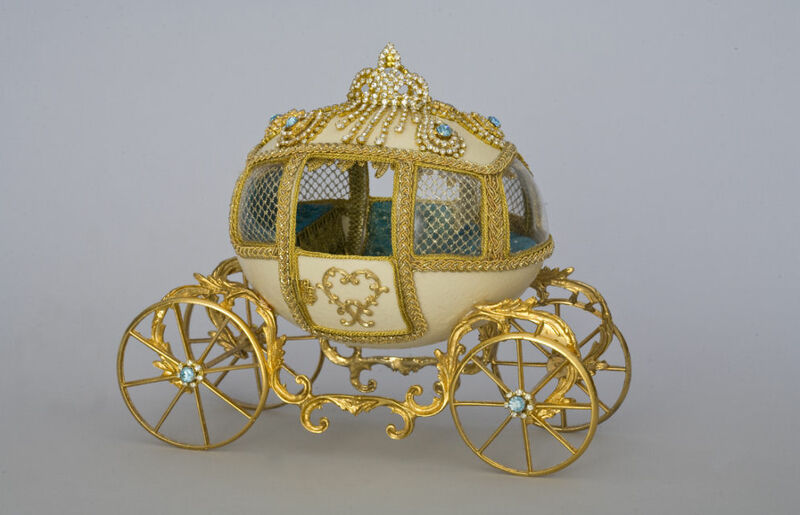 Ostrich Egg is delicately cut to form 'Cinderella's Carriage' with two full doors. 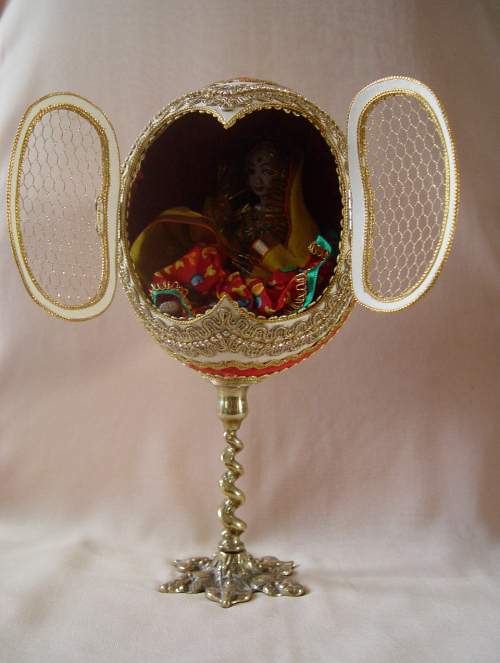 The egg is lined inside with golden lace and two seats made of red brocade are placed facing each other. A fanciful ceiling made of shimmer crepe holds a chandelier completes the interior decoration. 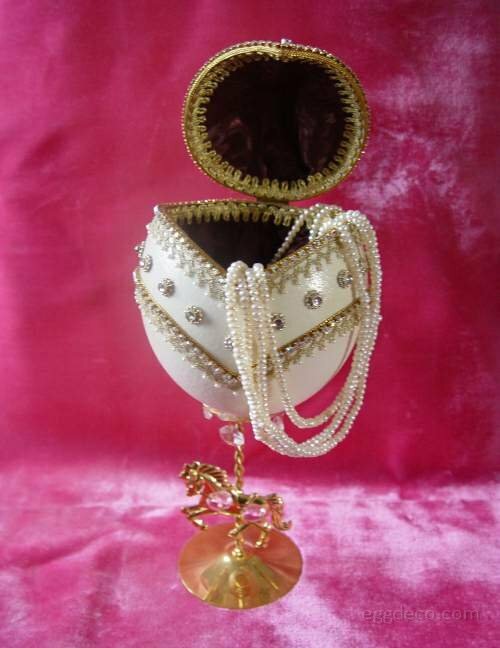 The exterior of the shell is lined with golden cord, filigree and chains of pearls. The windows are covered with transparent acrylic. 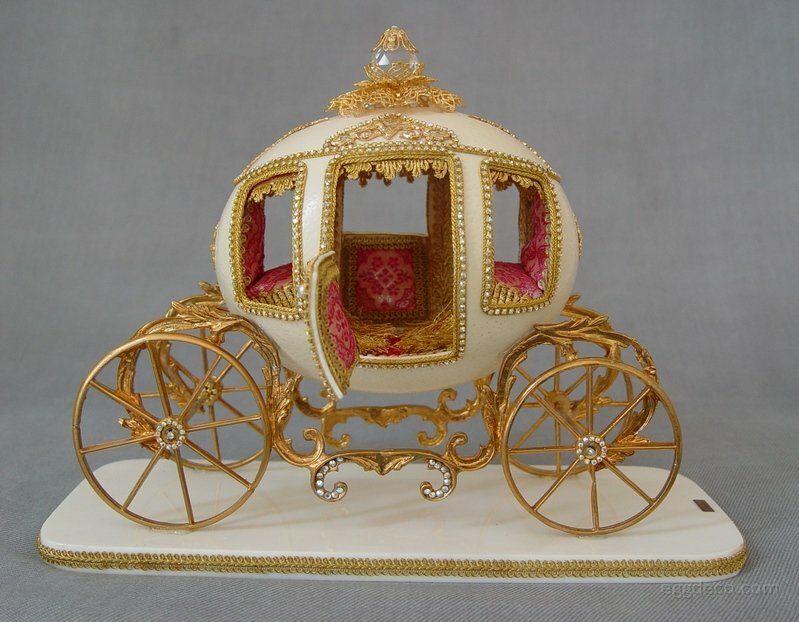 The carriage top is embellished with golden maple leaves, pearls and a crown. 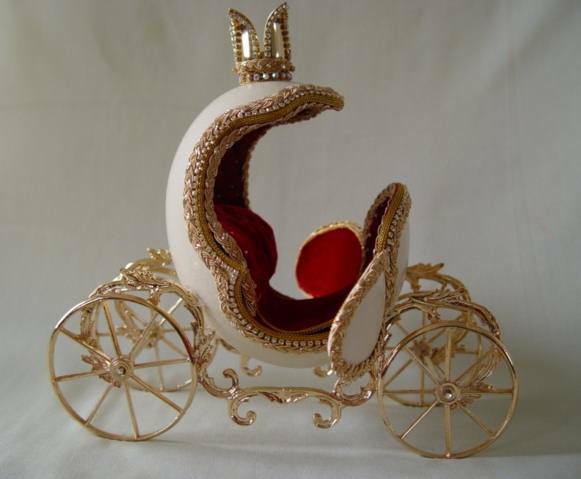 The egg is mounted on a gold-plated coach. 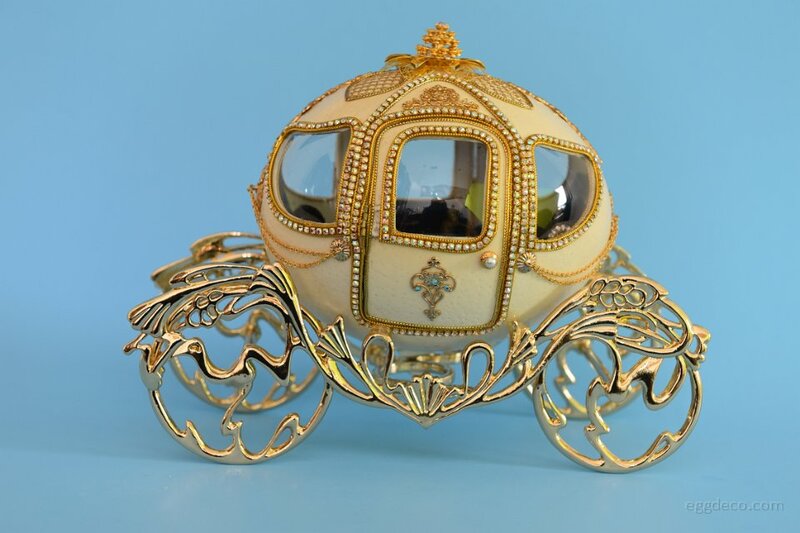 This egg art piece is inspired by a similar carriage shown in the movie ‘Cinderella’. 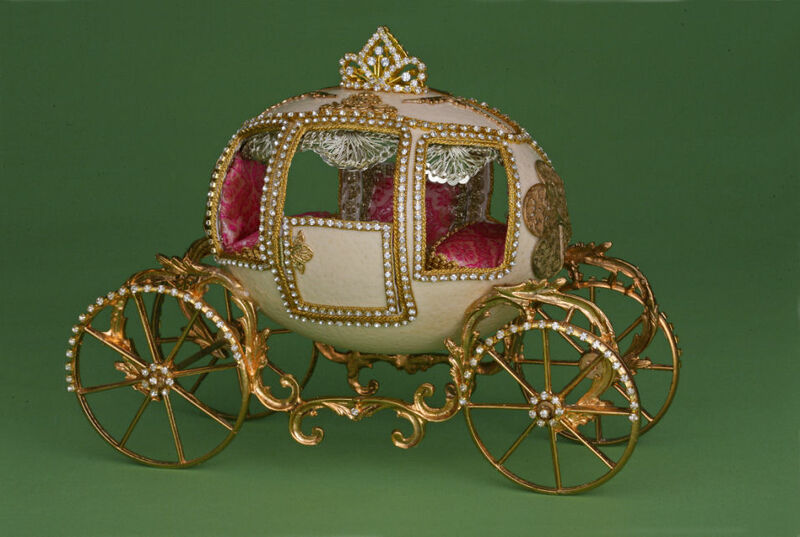 Ostrich Egg is intricately cut to form a coach with two full doors decorated with brocade from inside. Two seats made of blue brocade and brown velvet cushions are placed facing each other. 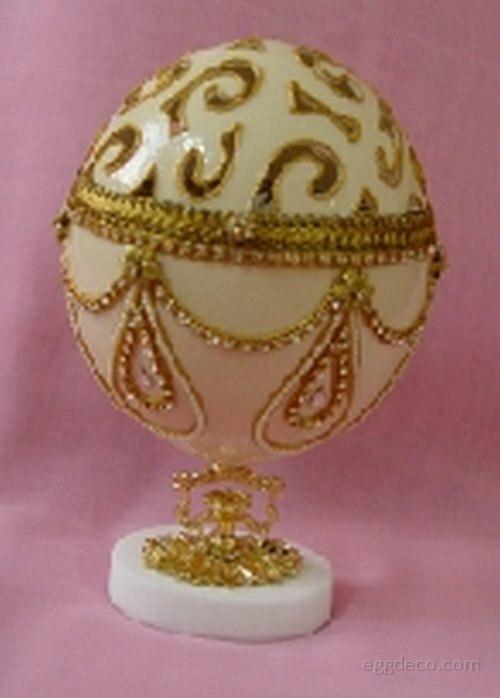 The egg is further embellished with golden filigree and rhinestone chain. 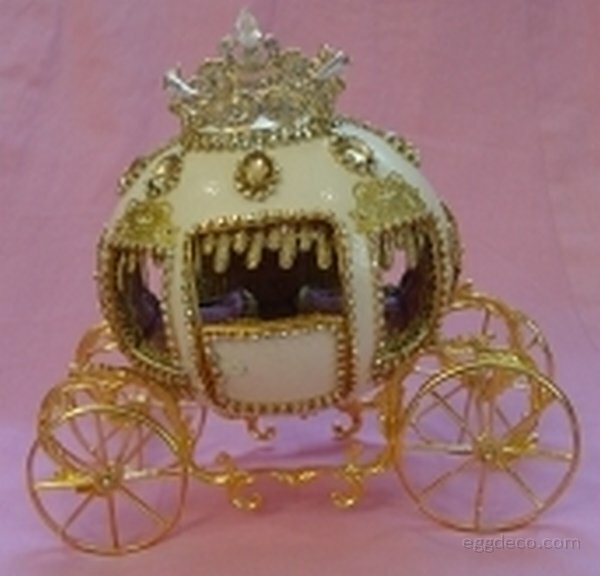 The egg is mounted on a golden coach. 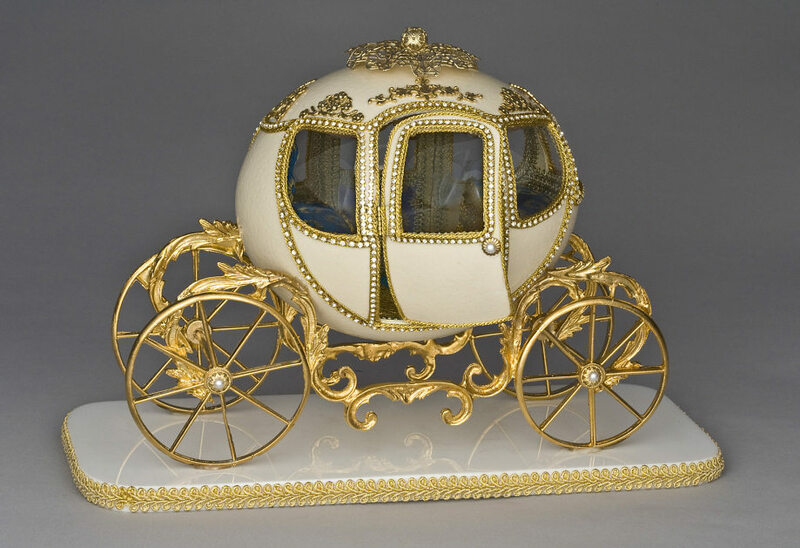 Ostrich Egg is delicately cut to form an imperial coach with two open doors. 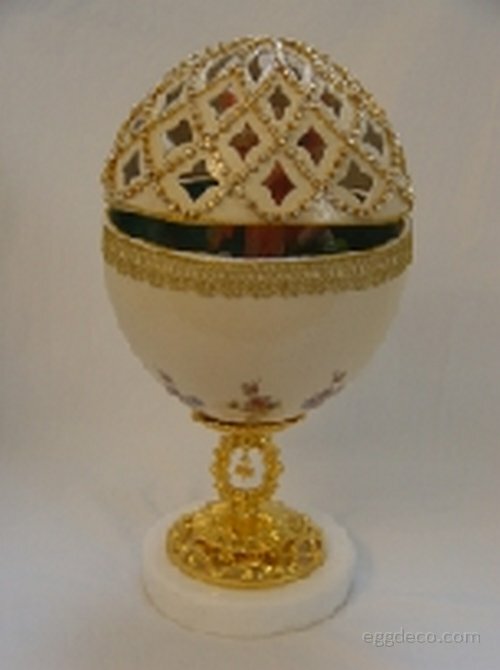 The inside of the egg is lined with heavy golden lace. Two seats made of pink brocade using tufting technique are placed facing each other. 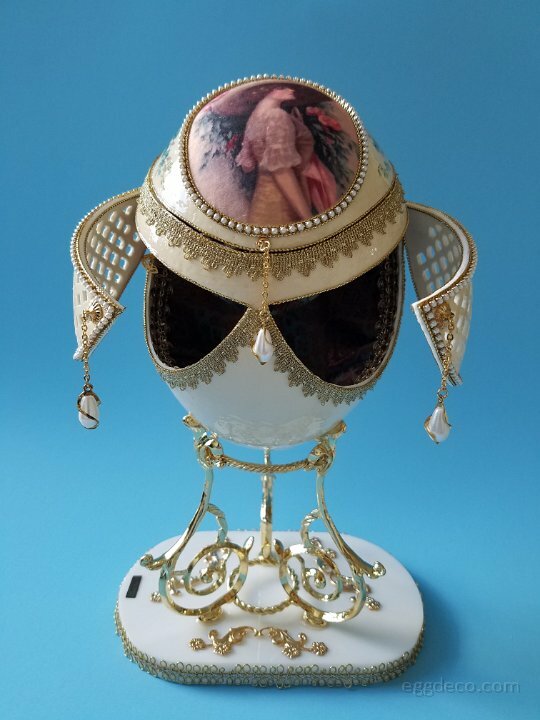 A fanciful ceiling made of soft velvet and the exterior lined with golden cord and rhinestone chain adds beauty and elegance to this egg art piece. The doors of the coach are decorated with brocade from inside. 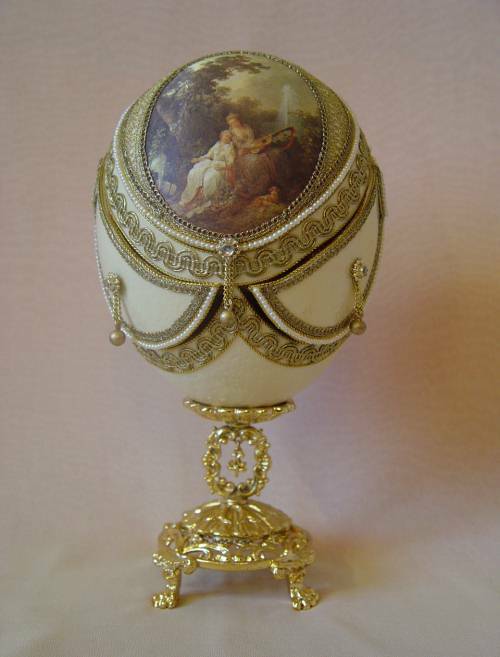 A beautiful crown completes the decoration of this egg. 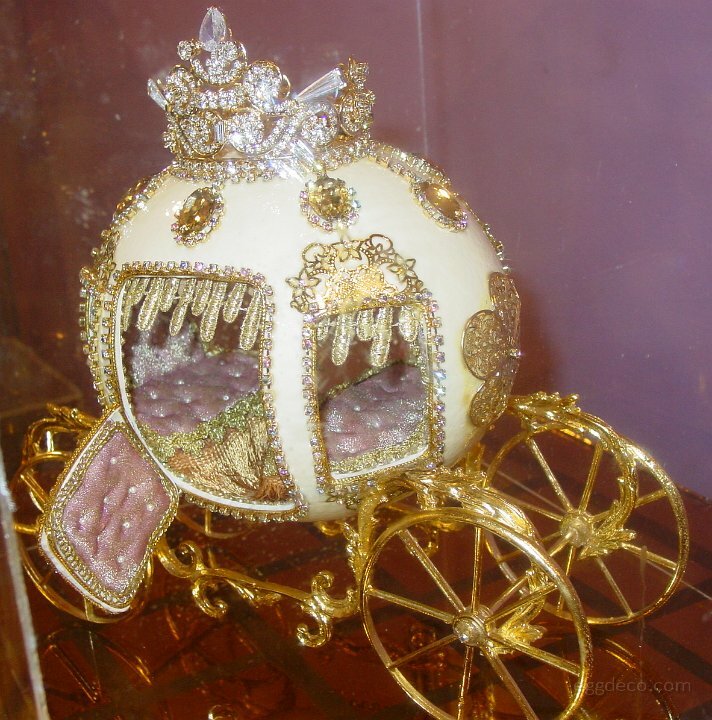 The egg is mounted on a golden coach, which is decorated with rhinestones on the wheels. 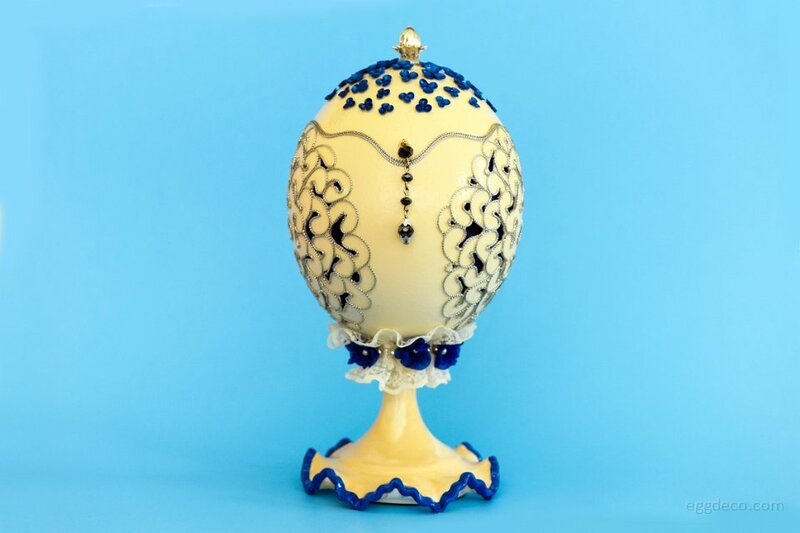 This egg is reminiscent of colonial opulence. 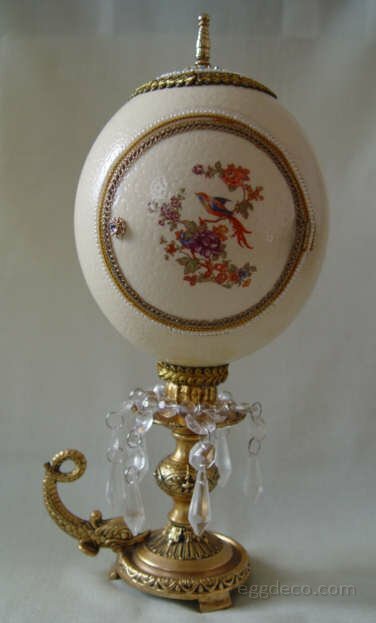 Ostrich egg is intricately carved in a ripple form on the upper half, while the lower portion is embellished with floral water-slide transfers. 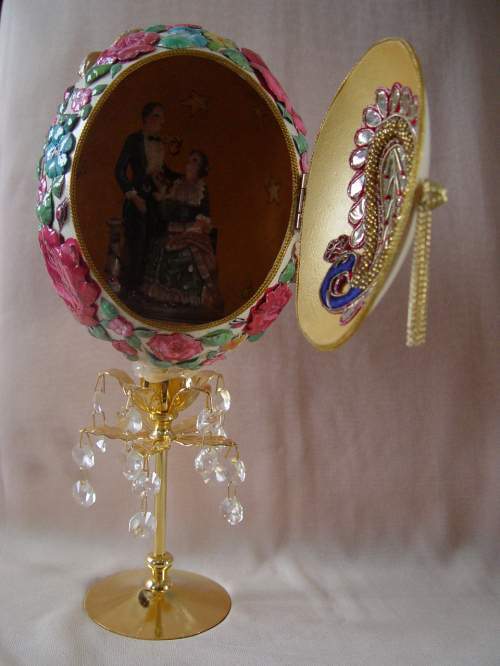 The ripples are decorated with rhinestone chain. The ornamentation is further enhanced by lining the interiors with maroon-coloured silk brocade. A golden chain is added as a stopper. A fancy tassel is attached to facilitate the opening of the casket. 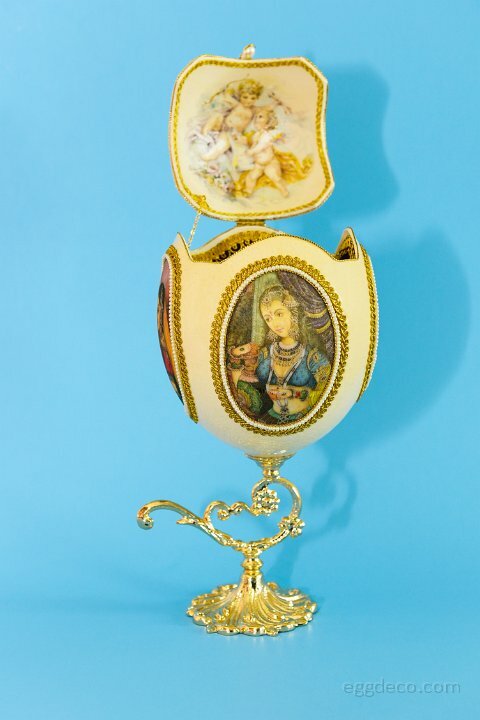 The egg is placed on a beautiful golden stand and mounted on a base. 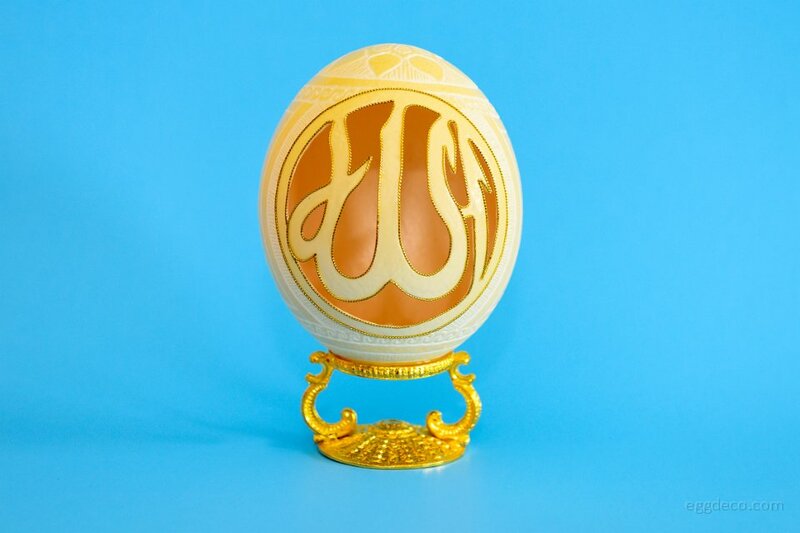 Ostrich Egg is intricately carved all around in free hand. 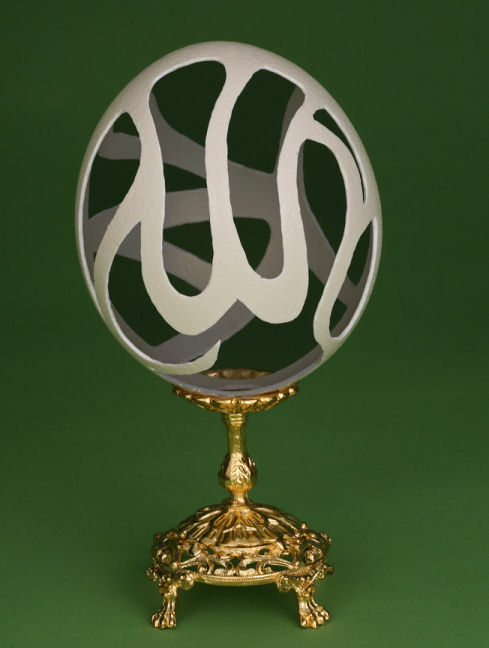 The egg is mounted on a metal stand and placed on a Corian base.